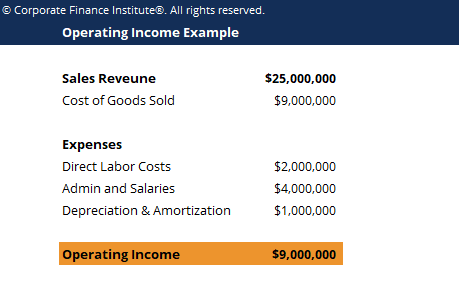 This operating income template shows you how to calculate operating income using line items from the income statement. Operating income also referred to as Earnings Before Interest & Taxes (EBIT)EBIT GuideEBIT stands for Earnings Before Interest and Taxes and is one of the last subtotals in the income statement before net income. EBIT is also sometimes referred to as operating income and is called this because it's found by deducting all operating expenses (production and non-production costs) from sales revenue., is the amount of revenue left after deducting the operational direct and indirect costs from sales revenue. This can also be computed using gross income less depreciation, amortization and operating expenses not directly attributable to the production of goods. Interest expense, interest income, and other non-operational revenue sources are not considered in computing for operating income. Another way to calculate income from operations is to start at the bottom of the income statement at Net Earnings and then add back interest expense and taxes. This is a common method of an analyst to calculate EBITEBIT GuideEBIT stands for Earnings Before Interest and Taxes and is one of the last subtotals in the income statement before net income. EBIT is also sometimes referred to as operating income and is called this because it's found by deducting all operating expenses (production and non-production costs) from sales revenue., which can then be used for valuation in the EV/EBIT ratioComparable Company AnalysisHow to perform Comparable Company Analysis. This guide shows you step-by-step how to build comparable company analysis ("Comps"), includes a free template and many examples. Comps is a relative valuation methodology that looks at ratios of similar public companies and uses them to derive the value of another business.